I’m running a wholly foreign-owned enterprise in Vietnam with over 200 employees. Do I have to buy unemployment insurance for my employees in addition to social insurance? How does Vietnamese law prescribe the responsibility of enterprises for unemployment insurance? – Seasonal or job-based labor contracts with a term of between full 3 months and under 12 months. In case an employee has entered into and is performing more than one labor contract specified above, he/she and your enterprise (the employer) under the first labor contract have to participate in unemployment insurance. As prescribed by the Vietnamese law, any enterprise that employs 10 employees or more is required to participate in unemployment insurance. Employing more than 200 employees, your enterprise is, therefore, obliged to purchase unemployment insurance for its employees. The employer is required to make and submit unemployment insurance dossiers for its employees to social insurance organizations within 30 days from the effective date of labor or working contracts of such employees. For an employee who enters into a seasonal labor contract or job-based labor contract of a term of between full 3 months and under 12 months before January 1, 2015, and is performing such labor contract, the employer is obliged to purchase unemployment insurance at least three months before the expiration of the labor contract. For an employee who enters into more than one labor contract and is currently covered by unemployment insurance under the contract which is the first to take effect, if the termination or change of such contract makes such employee no longer a policyholder of unemployment insurance, he/she and your enterprise (the employer) that are required to participate in unemployment insurance under the labor contract which is the next to take effect will have to buy unemployment insurance in accordance with law. An employee, who falls ill or takes a maternity leave of 14 working days or more and does not receive a monthly salary but enjoys a social insurance allowance, or for whom the performance of the lawfully entered labor or working contract is postponed, is not subject to unemployment insurance during such period. Within two working days after an employee terminates his/her labor or working contract, you (his/her employer) have to provide him/her a copy of such contract, or to confirm his/her unilateral termination of the contract, and carry out procedures for certifying the payment of unemployment insurance premiums for your employees to complete their unemployment insurance dossiers. Before January 15 every year, your enterprise is required to report the unemployment insurance participation in the previous year to the provincial-level Department of Labor, War Invalids and Social Affairs. What are prescribed unemployment insurance premiums? Every month, employees have to pay an unemployment insurance premium equal to one percent of their monthly salary, while the employer is required to pay one percent of the monthly salary fund. The time of payment of unemployment insurance premiums by employees and employer is the time when compulsory social insurance premiums must be paid. How to handle for postal items that are refused to be received by sender? When can an employee receive an allowance for a job loss? 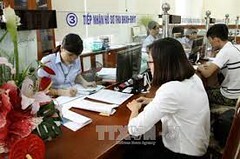 Rights of investors in Vietnam?